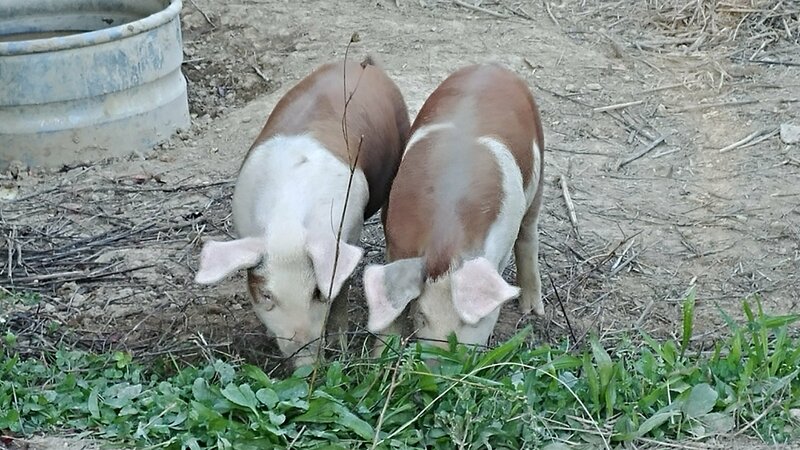 The gate has been opened to the bigger paddock for the piglets because they’ve stripped all the greenery from their little area, but they still are afraid to cross where the gate was previously locked. Now, we start the coaxing. We tried feed. They would go a little out and then right back inside. We left the gate open Saturday night in hopes that they’d venture out. They did not. Sunday morning, Ted fed them French Toast. 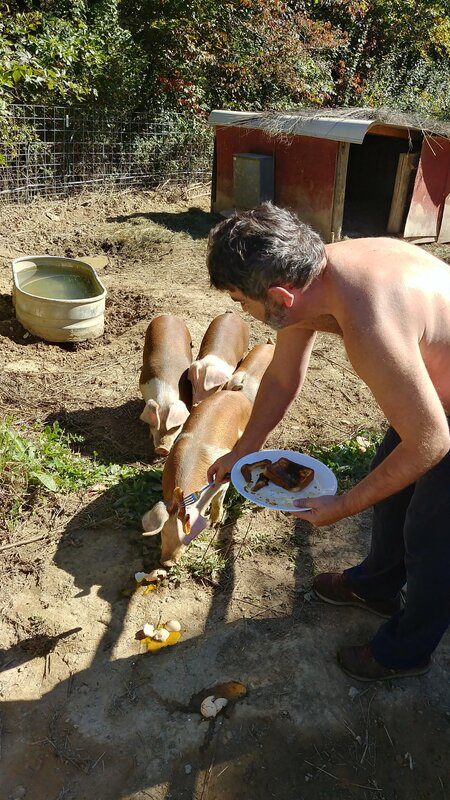 Yes, he’s feeding that pig with a fork from a plate. What can I say? 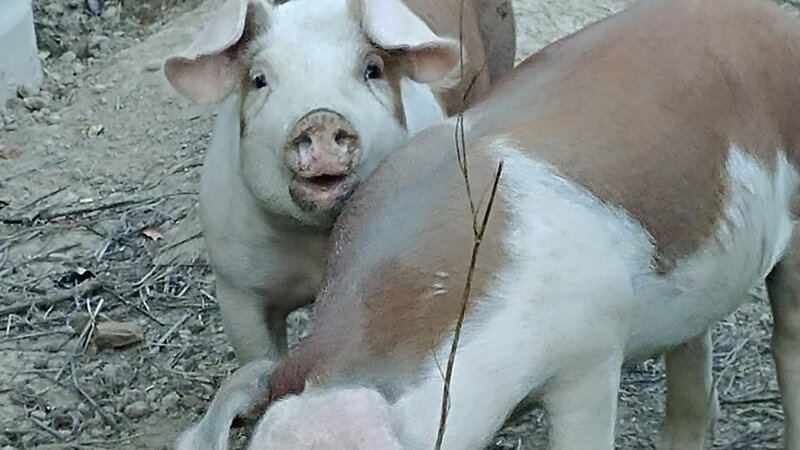 We have some mighty spoiled pigs here at Striving Acres. 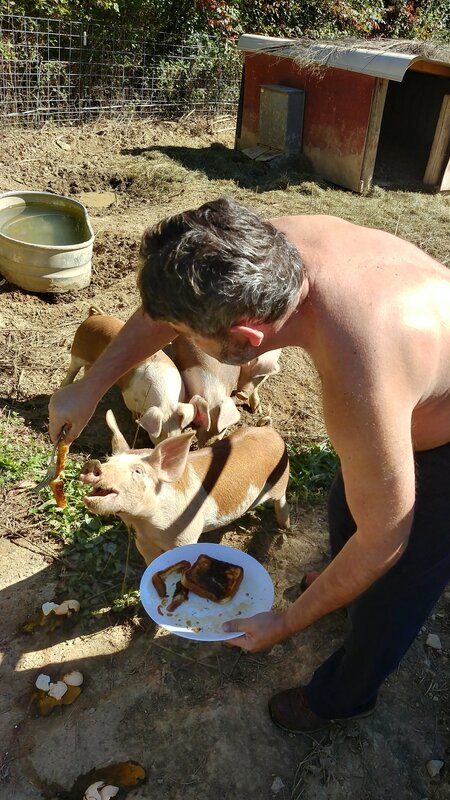 The French Toast got the piggies a little further out, and then we coaxed them a little more with eggs. So far, they’re about six feet into the paddock but refuse to go further. We’re giving them some space and will try again tomorrow with marshmallows. It’s just a learning process for them, so we have to be patient! Put their normal feed on the ground 6-8 ft inside the new paddock. Tomorrow morning move it a few feet further in. Once you get them following the feed, place the gate wherever you will. Close the main barn lot/ front paddock. If you want to train them to load easily, park the trailer in the paddock and start feeding in it. Much easier than running them up a shute.